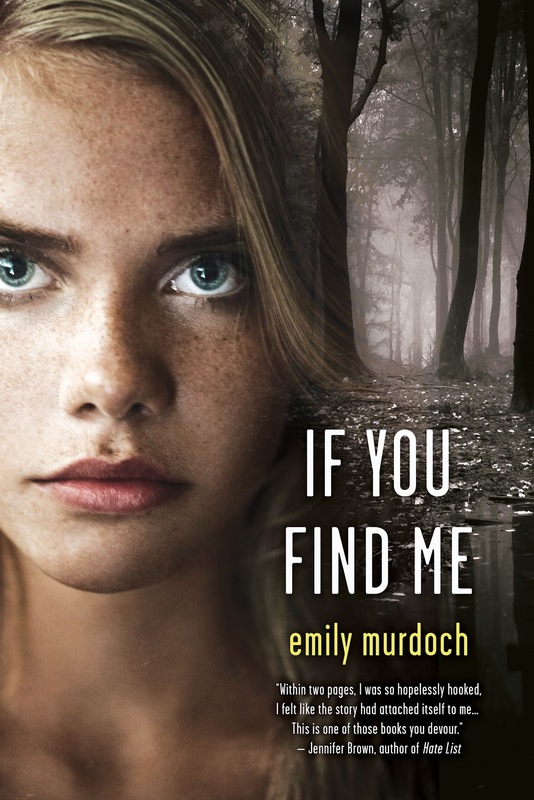 I am so ridiculously excited to be taking part in the cover reveal Emily Murdoch's upcoming contemporary YA debut! This book was formerly titled The Patron Saint of Beans, and now has a new title... which you will see, below, on the cover! And now is where I hush for a bit to let you ooh and awe at this gorgeous piece of work! Um. Yeah. Is that not gorgeous, and intense? The straight on face of the girl, and the force of her stare is pretty freaking potent. Plus I love the woods, and even the little pond going on. Oh. Man. You guys, I want this book SO much. I've wanted it for months already, but now that there's something visual to it. Woo. Want. Need. Whine. And now for what the book is about! A broken-down camper at the Obed Scenic and Wild River National Park - dubbed the Hundred Acre Wood - is the only home fifteen-year-old Carey has ever known. Sure, coping with a bipolar mother on meth is no picnic, but beneath the sun-dazzled canopies of Hickory and Walnut, Carey's violin transports her from their bare-bones existence in the same way her little sister, Jenessa, finds comfort in her stash of second-hand Pooh books. Life is dependable that way, until Mama goes into town for supplies and vanishes off the face of Tennessee, sending social services in her wake with a one-way ticket back to their father - a stranger in an even stranger world. Guys. I need this book in my life something fierce. But you know what's even better? A portion of the proceeds will benefit Taylor Hendrix's Christmas Project: Seventeen-year-old Taylor, battling osteosarcoma, gathers gifts in backpacks to brighten the spirits of cancer teens in hospital during the Christmas holidays. In case you missed it, that blurb up there on the cover? It's by Jennifer Brown. Yes, the amazing woman behind Hate List, Bitter End and Perfect Escape. And here's what she has to say: "Within two pages, I was so hopelessly hooked, I felt like the story had attached itself to me... This is one of those books you devour." Yeah. Woo! This one is coming April 2, 2013 from St. Martin's Griffin, but if you're like me, and absolutely cannot wait, then you're in luck! I have a chance for one lucky person to win an ARC of this one! To enter, just fill out THIS form! Help spread the word about the cover reveal and title change, be it on your blog, in a tweet, or on facebook, and leave the link in the form. This contest is US only, and ends July 6. And don't forget to stop by Emily's blog, because she has even more to say about all this, and admit it, you know you want her side of things! Also be sure you add If You Find Me to your Goodreads shelf, and follow Emily on twitter. Her tweets rock, and she has some of the cutest pets around. That is an excellent cover!! Added it to my TBR list...now only 10 months to wait O.o lol. Thanks for sharing, Kari! This book looks really good. Thanks for posting it!